When and Where was Anne Bronte Born? 17th January 1820, The Vicarage, 74 Market Street, Thornton, Yorkshire, England. Anne Bronte was the daughter of a Cleric, Patrick Bronte and sister to Branwell, Charlotte and Emily Bronte. At home by family members. 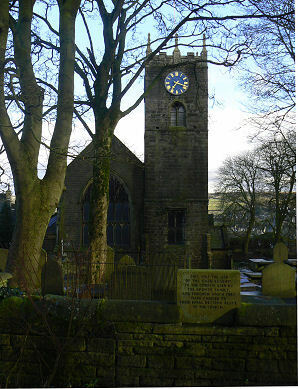 1820: On March 25th Anne was baptised in the “Old Bell Chapel at Thornton. 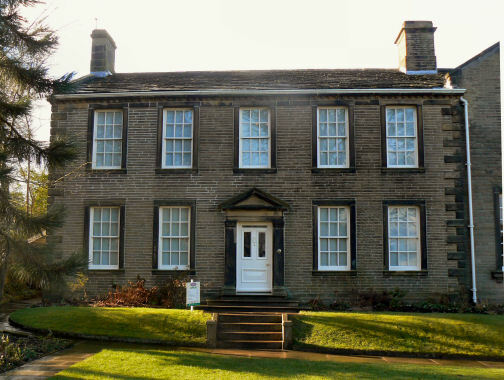 The Bronte family move to the Parsonage at Haworth in April. 1821: In May Elizabeth Branwell, her aunt and sister to her mother Maria, arrives to care for her sister who is dying of cancer and look after the children. (September 15th) Death of her mother, aged 38. She is buried inside the church at Haworth. 1825: (May 6th) Deaths of her sister Maria (aged 11) on May 6th and Elizabeth (aged 10) on June 15th from consumption. 1828: Anne’s earliest surviving drawing is made of a church surrounded by some trees. 1829: All the Bronte children receive art lessons from John Bradley of Keighley. 1831: Anne and Emily break away from Charlotte and brother Branwell’s world of Angria and form their own fantasy world of Gondal. 1834: Throughout the year Anne, Emily and Branwell have piano lessons from Abraham Sunderland the parish organist. 1836: Anne is awarded a good conduct prize at Roe Head School. Anne writes her earliest surviving poem about the Gondal world during her Christmas holidays, “Verses by Lady Geralda”. 1837: During the summer holidays Anne and Emily keep a diary. In November she suffers a life threatening illness and is visited by Moravian Minister James la Trobe. Anne is forced to leave the school because of her illness during December. 1838: Branwell sets up his own portrait studio in Bradford. 1839: Anne moves into Blake Hall, Mirfield in April to become a governess to the Ingham family. Branwell returns to Haworth after running into debt in Bradford in May. William Weightman arrives at Haworth during August and becomes an assistant curate to Patrick Bronte. Anne laves her post with the Inghams in December as she has had great difficulty controlling the unruly children. Branwell takes up a post as a tutor to the Postlethwaite family. 1840: Anne has much contact with William Weightman and falls in love with him. On May 8th Anne goes as governess to the Robinson family at Thorp Green Hall, Little Ouseburn, near York. In June Branwell is dismissed by the Postlethwaites. Anne accompanies the Robinsons on their annual holiday to Scarborough in July. They stay at Wood’s Lodgings on St. Nicholas Cliff in the middle of the bay. A drawing called “What you Please” is made at this time. Branwell is employed as a clerk at Sowerby Bridge railway station in August. 1841: Branwell transferred to Luddenden Foot as Clerk in charge of the station. Branwell has some of his poems published in the Halifax Guardian in June. Charlotte, Emily and Anne discuss plans of opening their own school. Anne spends five weeks at Scarborough with the Robinsons. 1842: Anne asks to leave the employ of the Robinsons as she wants to stay at Haworth whilst Charlotte and Emily leave for Brussels though the family beg her to return. Branwell is dismissed from the railways in March as one of his staff is caught “fiddling the books”. Anne spends six weeks at Scarborough during July with the Robinsons William Weightman dies of cholera aged 28 in September. Aunt Elizabeth dies of an obstruction of the bowel, aged 66 in October. Anne returns to Thorp Hall after the funeral. 1843: Branwell also goes to Thorp Hall to teach the Robinson’s son Edmund. Anne is given a spaniel by the Robinson girls. Anne spends four weeks at Scarborough during July. 1844: Anne spends five weeks at Scarborough during the summer. She writes a poem “Fluctuations” whilst there. The sister’s plan to open a school at Haworth fails as they get no takers due to the remoteness of the location. 1845: Arthur Bell Nicholls arrives in Haworth in May to take on the post as Curate to her father. Anne resigns her post at Thorp Hall in June. Branwell is dismissed from Thorp Hall in July for having an affair with Mrs Robinson. 1846: Charlotte sends manuscripts of the sisters poems to the publisher Aylott and Jones of London. “Poems by Currer, Ellis and Acton Bell” (The sister’s pseudonyms) published in May with the family paying the costs. Anne completes “Agnes Grey”. 1847: Anne Bronte’s “Agnes Grey” and Emily’s “Wuthering Heights” are accepted for publication by Thomas Cautley Newby in London. Charlotte’s “The Professor” is rejected. Anne begins writing “The Tenant of Wildfell Hall”. 1848: “The Tenant of Wildfell Hall” is published. Death of brother Branwell on 24th September from consumption. Death of sister Emily from consumption on 19th December. Anne has poems published in the Leeds Intelligencer and Fraser’s Magazine. 1849: Anne is examined at Haworth by Doctor Teale in January and found to have consumption. She goes with her friend Ellen Nussey and Charlotte on 25th May to Scarborough. Anne goes swimming the next day alone but collapses later. In the afternoon she drives herself on South Sands in a donkey cart. On May 27th she walks along the Spa Bridge with Charlotte and Ellen but has to sit down exhausted and realises she has not long to live. She discusses with Charlotte about returning to Haworth but it is too late. (1893): The Bronte Society Established. 1846: “Poems by Currer, Ellis and Acton Bell”. 1847: “Agnes Grey” (Acton Bell). 1848: “The Tenant of Wildfell Hall”. 28th May 1849, Woods Lodgings, Scarborough, Yorkshire, England, of consumption. St. Mary’s Churchyard, Castle Road, Scarborough, Yorkshire, England. Brontë Parsonage Museum, Haworth, Keighley, West Yorkshire BD22 8DR.